Masterflex have just returned after exhibiting with a large display of companies from the furniture, joinery and woodworking industry, all under one roof at W14 – N E C, Birmingham. Exhibitors had the opportunity to showcase their machinery, materials and components, with the aim of raising awareness of their company, meeting potential customers and developing lasting relationships. Masterflex staff (Colin, Gareth and Hayley) had time away from the office to speak to visitors and promote the company and the products from their stand. Business cards and product guides were given out in order to promote our range of flexible hose and ductings designed for the woodworking industry. Great interest was shown in our Flamex range and we look forward to receiving many orders. 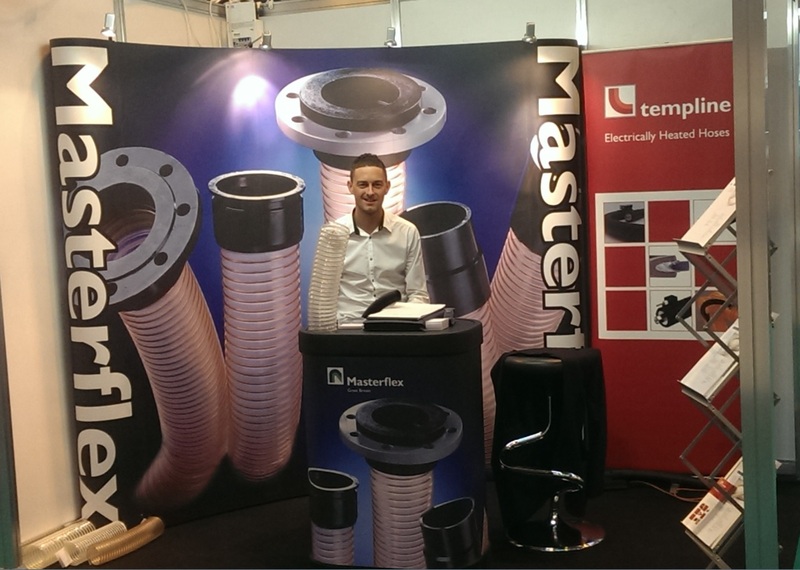 Don’t forget Masterflex manufacture hoses and ductings to suit a wide range of applications for industries including Construction, Chemical, Food, Pharmaceutical, Heating, Air conditioning and Ventilation, plus many more. This entry was posted in Antistatic & Electroconductive hose, Automotive - Motor sports / F1 / Boats / Rail, Charity and Other, Chemical - food & pharmaceutical, Dust & Fume Extraction, Environmental, High Temperature Hose, HVAC - Heating, Ventilation and Air Conditioning, Materials Handling - Plastics, Rubber , Powders, Microbe & Hydrolysis-Resistant Hoses, Paper, Printing and Packaging, Plastics, Street cleaning leaf and grass collection, Uncategorized, Woodworking Industry and tagged abrasion resistant hose, air and ventilation hose, Chemical Ducting Fume Extraction, DUCTING, Ducting Connecting Systems, Ducting Exhaust Extraction, Ducting PU Hose, ductings, Dust extraction hose, dust extraction hoses, Dust Extraxction Ductings, Exhaust Extraction Ductings, Exhaust Extraction Hose, exhaust fumes removal, flexi ducting, Flexi Ducting Hose, Flexi ductings, flexi hose, Flexi Hoses, Flexible ducting, flexible ductings, Flexible hose, Flexible Hose Polyurethane Ducting, flexible hoses, FlexiHose, Fume Extraction Ductings, Fume Extraction hose, High temperature ducting, High Temperature Ductings, High temperature hose, High Temperature hoses, hose, hoses, Masterflex technical hose ltd, Masterflex technical hoses ltd, Polyether-Polyurethane, Polyurethane ducting, polyurethane ductings, Polyurethane hose, polyurethane hoses, PTFE Ducting, PTFE Ductings, PTFE Hose, PTFE Hoses, PU DUCTING, PU ductings, PU hose, PU hoses, PUR hose, PVC ducting, PVC ductings, PVC Flexible Ducting, PVC Flexible Ductings, PVC hose, PVC hoses, Silicone Ducting, silicone ductings, Silicone Hose, silicone hoses, suction and transport hose, templine Heated Hoses, Weld Fume Extraction, Weld Fume Extraction Hose. Bookmark the permalink.